Round about 2 weeks ago I was allowed to be part of a wonderful and exciting show done by FEROSH for the SLB12. The big SL Birthdays are always very amazing done events and so it was a pleasure to be allowed to be part of that. FEROSH was asked to do a fun show for the event and Absinthe and her Team chose a very special theme for that show. For the stylings of the show we got 2 sponsors, that supported FEROSH for that special show. AZUL and SoliDea FoliEs. 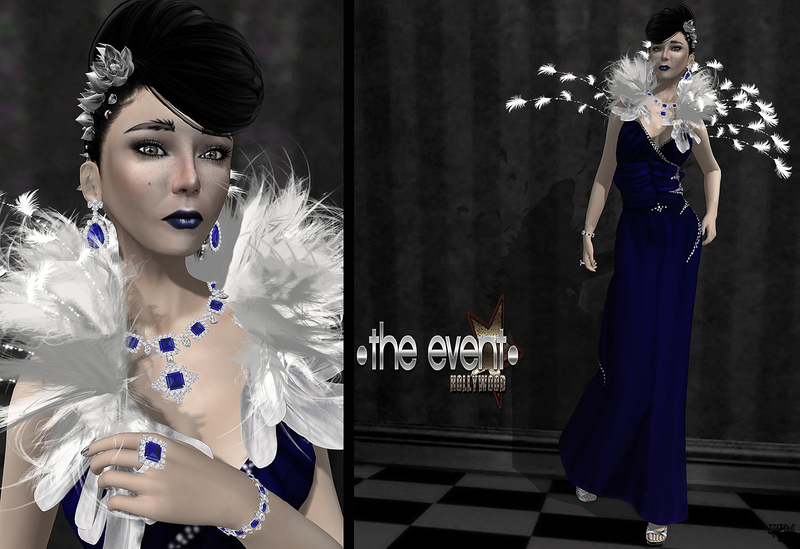 I had the pleasure to style one of the amazing AZUL gowns called “Francesca”. 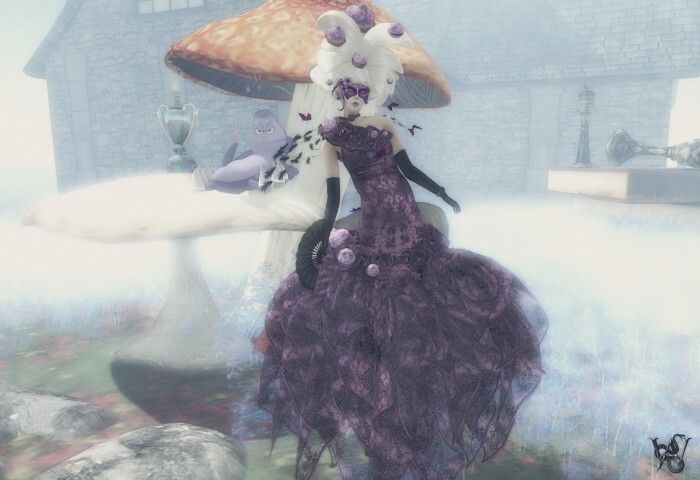 I loved that dress so much for that theme because of the puffy, fluffy skirt and the amazing fabric with the dark delicate lace on the wonderful amethyst satin looking fabric. For the face I wanted a mystic touch as well as some hint to that time period as well. The “Vendetta Lips” from Madrid Solo come close of the heart lips, wich were very popular to the Marie Antoinette look, but we well they looked more modern and were going with my idea for the look so much better. The amazing mask was made by Illusion and thanks to a color change menu I was able to match it to the rest of the styling. To get some more mystic and maybe dark touch, I added a laced eye mask under it. To bring back the rose shaped parts of the dress I wanted some jewelry that picks up that idea but would not be too colorful. The choice fell on the “Shippoah” set from Mandala. Thank you Absi and all that was with me in that wonderful show for an amazing experience, that paired fun and professionalism! Sometimes when I just style for fun I try to make my self different tasks. Sometimes it is certain styles or even certain colors or color combinations. Today I was in a little black and yellow mood after I tried one of the latest releases from Bubble’s Design. The “Tiffany Yellow” dress, that Bubbles released not too long ago brought me on the idea of the yellow & black color combination and I wanted to pull it through the whole styling and picture. To the “Tiffany Yellow” dress from Bubble I added the newest shoe release from LeeZu, the “Piazza Navona” ankle boots. I love the non usual and crazy stuff anyways and this shoes just totally caught my heart. For this post I decided to go with the yellow ones but you can have them in nearly all colors at the LeeZu Mainstore. The “Anna” stockings I found as well at LeeZu. Black Widow – Dark News from EMO-tions & LovelyMi! Fresh New Look with E-Clipse! The “Lynxa”gown was made for Essence of Ebony 2012 contest and was worn by Miss Benin – Lynxa on the final day. The original color – orange with yellow and green represents the country of Benin, and not only by the colors and fabrics, but with the style as well. The hat is an inseparable part of a Benin folk dress and for Lynxa it has been especially crafted here in SL. The real eye-catcher on this gown is the golden texture. 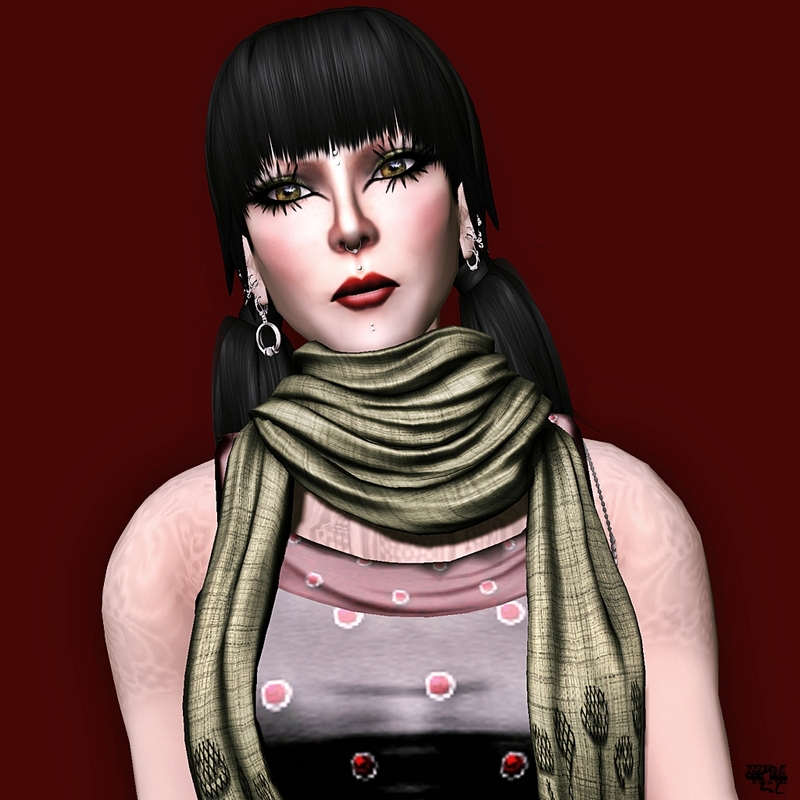 Gold is, for sure, the hardest one to reproduce in SL, and Dani Plassitz, owner and designer of Styles by Danielle, has tried her best to make you shine like the sun. Every detail of the dress is carefully put together. The front jewel and the back sheer fabric are modifiable for you to perfectly adjust it to your shape. The skirts attached to legs come with the special resizer that can resize in any direction. This is especially helpful if your av is very tall or very small. The “Lynxa Gold” jewelry set that is made especially to complete this gown. The rhombus and gems resemble the fabric design, and the gold shine is underlined by the texture itself. The set is transferable and it consists of: necklace, two bracelets, earrings and the ring worn on the index finger. With my name for sure I again was last to walk out :). We first had to walk our styling of the first round and then in another walk the new one. At the end of the runway, Topaz and Lovely waited on us and we had a short interview at the end of our second walk. Both were very nice and kind and made it easier for us and as well they took some of my nervousness :). We all know the awesomeness and problems of the new mesh clothing in SL 🙂 Many designers already released mesh clothing and it really is a wonderful possibility to let the avatar look with certain clothes come more real. No more silly knee angles, no more skirts that fall trough chairs if you sit on. The idea of mesh really is a great revolution, even if there has to be done much more work on still.Everyone that uses one of the mesh featured SL viewers, can wear mesh.